Caracas Chronicles: "We've shown that we're not authoritarian..."
Chavez said the government has begun to review all television concessions, which expire in 2007. Chavez did not specify which stations may be shut down. Chavez, 51, said some television stations helped plot a two-day coup he survived in 2002. The former army lieutenant colonel, who led a failed coup in 1992, is seeking a second six- year term in office in the December elections. 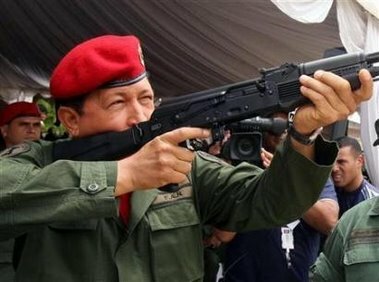 Chavez made his comments during a ceremony to receive the first 30,000 Russian Kalashnikov AK-103 rifles out of an eventual 100,000 Venezuela will buy this year. Venezuela purchased the rifles to defend against a possible invasion by the U.S., Chavez said. The U.S. State Department has said the country has no plans to invade Venezuela. Chavez also said today that Venezuela plans to buy Russian helicopters and build a factory to make rifles and bullets.